In the second menu (under the header bar) click Settings. In the menu on the left side of the page, click Library Links. A text entry box and a menu of checkboxes will appear. If SUNY Empire State College is not one of the checkbox options, enter it into the text box and click the search button. Once it is one of the checkboxes, make sure there is a check in that box. Then click the Save button. Click Save again to get out of Settings. 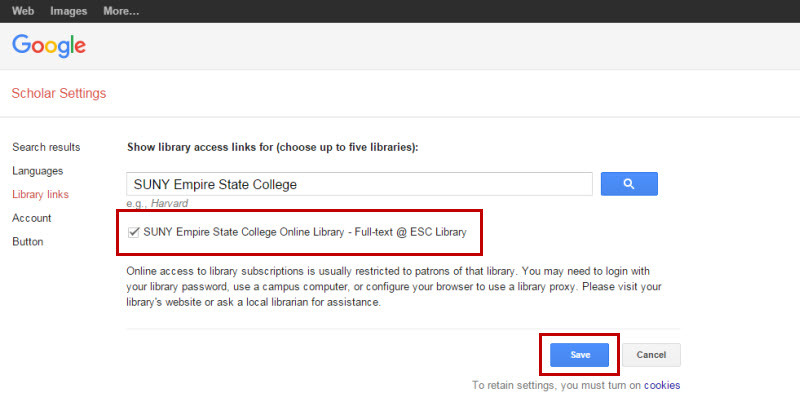 Now you can search Google Scholar and access full-text articles from the Empire State College Library subscriptions, as well as articles on the open web. 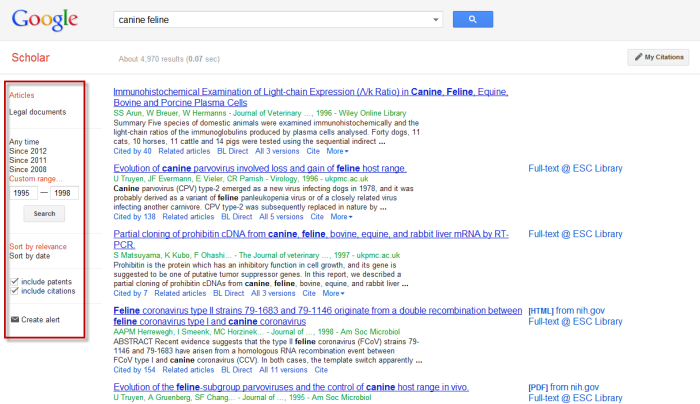 You will find full-text links to the right of the search results. They will say "PDF from" or "HTML from" or "Full-text @ ESC Library." Format article citations in APA, MLA, etc. 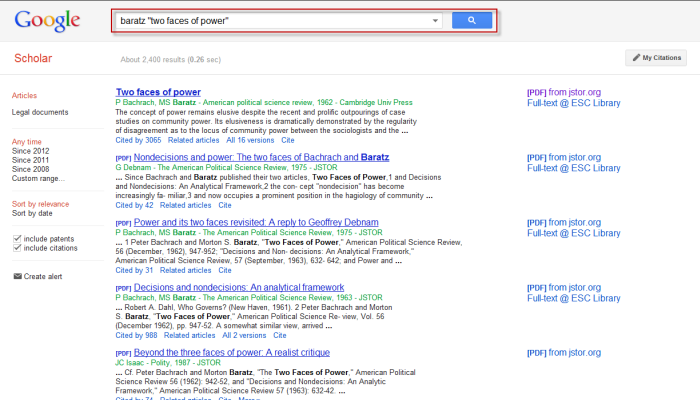 Are All Articles From Google Scholar Scholarly? Is the author a subject expert? Is the article written for other experts? Click here for an explanation of scholarly versus popular information sources. If you mis-spell something, Google will offer suggestions. Put author:"Smith" to search for an article by author's last name. Google assumes that you want the AND operator all keywords. So if you search canine dog wolf, it's as if you were searching canine AND dog AND wolf. Google does use the OR operator. You can put (canine OR dog OR wolf). Google doesn't use the NOT operator. Instead, use the minus symbol like this. "canine" -teeth -tooth. 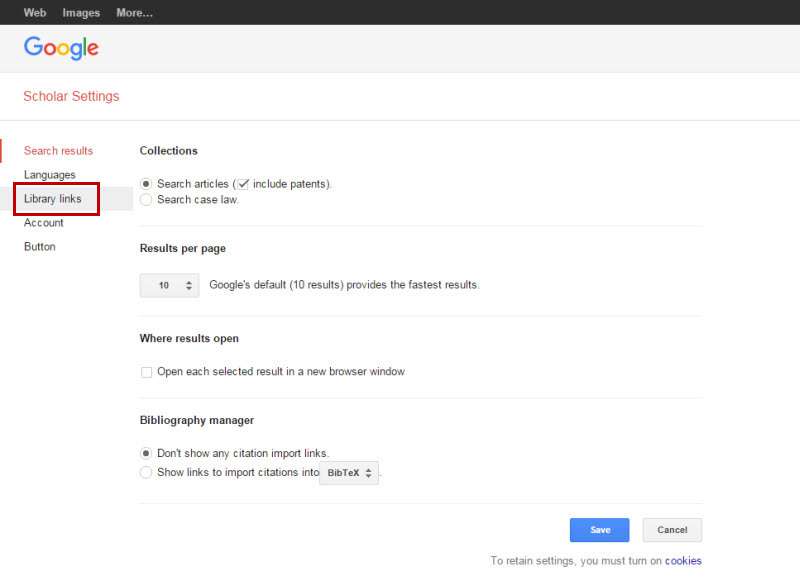 Put quotation marks around exact keywords or phrases that you want in every search result. Otherwise Google's "Smart Search" will interpret them as "strong suggestions" rather than absolute requirements. Your search results are sorted by popularity, which is based on how many other web sites link to them, and in turn, how popular those linking web sites are. You can change this option in the column to the left of the results list. Once you've searched, you can limit your results by date using the column to the left of the results list. If you know the article you want, type in the information you have, such as key words from the title and the author's last name. Put keywords and phrases of two or more words in quotation marks. 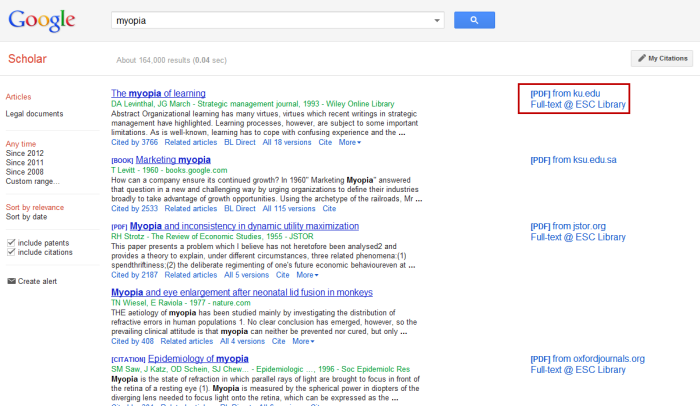 If you are searching by topic, type in keywords that describe it. Put keywords and phrases of two or more words in quotation marks. Google also provides search tips.